Contents of a backpack, objects on a bathroom counter, a partially eaten dessert are all fair game for a still life. By examining the objects around us in our everyday life we shine a lens on American life in the 21stCentury. This still life watercolor class will be devoted to the study of photorealism as a way to see the society in which we live. We will take inspiration from artists who did the same type of exploration in the 19thand 20thcenturies. Wayne Thiebaud, Janet Fish, Ralph Goings, Paul Cezanne, Andrew Wyeth, among others. 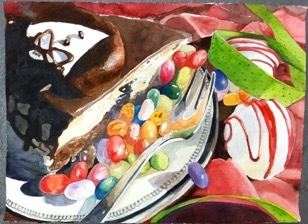 In class, artists will perfect their skills to compose, light and shoot their still lives. From images they shoot, artist will learn how to crop the images and transfer them to paper.